This entry was posted in Hours, Uncategorized on November 27, 2018 by Michael. Watson Library of Business & Economics will be closing early at 5pm on Wednesday, November 21st, and will be entirely closed on Thanksgiving Day, November 22nd, and Friday, November 23rd. Regular Fall hours resume on Saturday, November 24th. This entry was posted in Hours on November 20, 2018 by Michael. Watson Library of Business & Economics will be open for our regular hours this weekend, but will be closing early at 8pm on Monday, November 5th. Watson Library & Uris Hall will be completely closed on Election Day, November 6th. The Library will resume our regular Fall hours at 8am on Wednesday, November 7th. This entry was posted in Hours on November 2, 2018 by Michael. 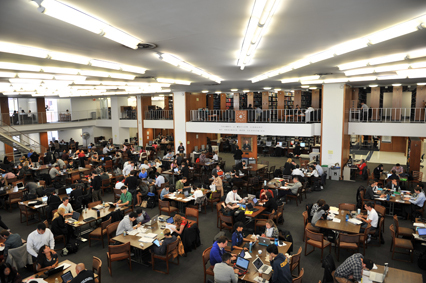 Watson Library will be open to all current graduate students, undergraduates in Economics, faculty and staff from 8am to 7pm, Monday through Friday, through Monday, October 22nd. At all other times during this period, i.e. after 7pm until close and all open hours on Saturday, Oct. 20th, and Sunday, Oct. 21st, access to Watson Library is available to all University affiliates. This entry was posted in Hours, Uncategorized on October 15, 2018 by Michael.